Major Cold is the last solar term of the year and is usually followed by the last chilly days before the Chinese New Year. The last solar term of the year, dahan, or Major Cold, also marks the last chilly days of the year. Dahan usually arrives on January 19-21 when the sun’s elliptical longitude reaches 300 degrees. This year it will arrive tomorrow. It is usually followed by cold days with limited rain over the next 15 days. Though data shows that the days after dahan are a bit warmer than the days around Minor Cold, or xiaohan, some of the coastal regions still record the lowest temperature after Major Cold. Yang (warm) energy is on its way up after Major Cold regardless of the low temperature. A Chinese proverb describes the days after dahan as “the three periods of waiting” – waiting for the hens to lay eggs, waiting for the hawks to hunt fiercely and waiting for the center of the lake to freeze completely. It is essential to keep the crops and livestock warm to ensure a good harvest during springtime and appropriate reinforcing therapies for people to improve their immune system and health. The sunshine on dahan has a rich glow to it. Bathing in it not only makes people feel comfortable, but also has health benefits by way of boosting the yang energy inside. Traditionally, Chinese households stop room heating on Major Cold, open the windows and let the cold air in. It is believed that the cold air will kill all the insects and thus help to clean the house before the onset of spring. Of course, heavy clothes are essential to keep the family members warm. Yazhuyouzha (literally squeezing lard cracklings 轧猪油渣) is a game that is played to help children warm up during the cold days. Two children sit back to back on a bench and try their best to push the other child with their back.By exerting themselves, the children will not feel cold while at the same time enjoy bathing in sunshine. 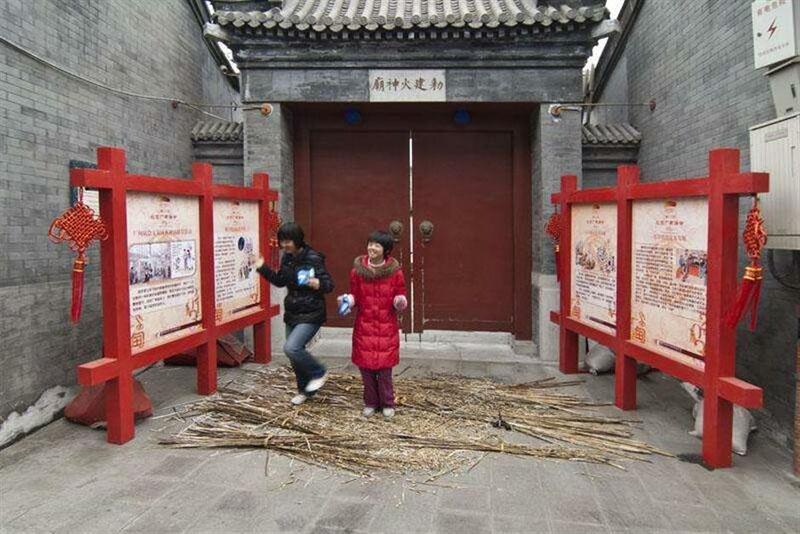 Treading down the sesame straws used to be a popular dahan tradition. Reinforcing dishes are very popular on dahan. Chicken soup with ginseng, wolfberry and black fungus are especially popular in Jiangsu Province. Hot thick soup is a common course in Nanjing that also includes such ingredients as meat, tofu, yam, fungus, sweet potato and pickled mustard tuber. In southern regions like Guangdong Province, people traditionally eat sticky rice on Major Cold to beef themselves up against cold. In Tianjin, there is a tradition called zheng la mi (蒸腊米), or steaming la rice. Here la means layue, the last month in the lunar calendar. Families traditionally select good rice, wash them and steam it well, then dry it out in the sunshine and preserve it in a porcelain jar. It can be preserved for dozens of years. Eating this rice helps the digestive system, while having it in summer helps prevent diarrhea. It is especially good for the elderly and weak. Since Major Cold is usually the last solar term before the Chinese New Year, it also marks the start of preparations for the most important festival in China. During the old days, Chinese people would go to the market and trade for what they needed for the Spring Festival, such as spring couplets, new clothes, and of course all ingredients for the Lunar New Year’s Eve dinner. Sesame straws were very popular back then as there was a tradition of spreading sesame straws on the street on Chinese New Year’s Eve. Children treading down the sesame straws was seen as a good omen that drove away evil spirits and kept them safe. Laba (腊八) and weiya (尾牙), two popular customs, often fall around dahan. Laba congee, a universal festive food on Laba Festival which often falls around dahan, is made of eight to 18 various ingredients, including rice, peanuts, red beans, lotus seeds, green beans, jujube, longan and gouqi. 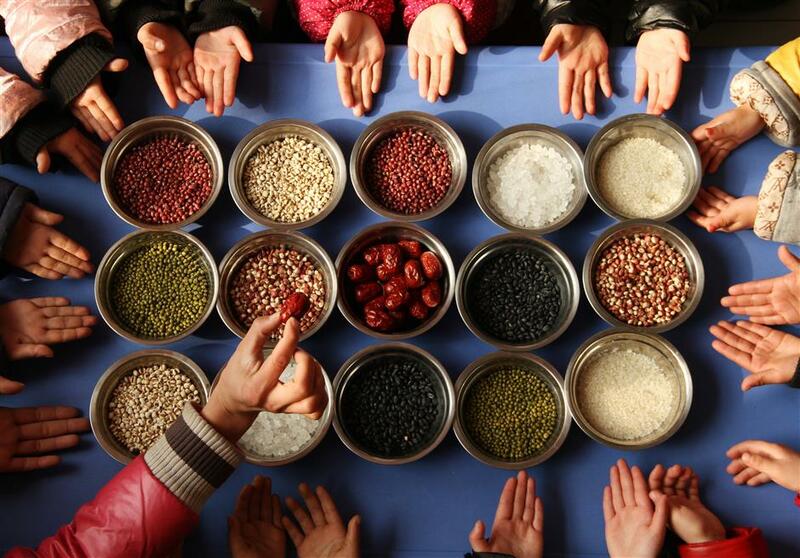 Laba, literally the eighth day of the 12th lunar month, is a festival on which Chinese celebrate good harvest and show gratefulness to the blessing of ancestors and gods. This year it falls on January 24. Though various food like laba garlic, laba tofu and laba noodles are cooked in different regions, laba congee made of various ingredients is a universal festive food that hardly misses the dinner table of Chinese family on the day. The number of ingredients can range from eight to 18. 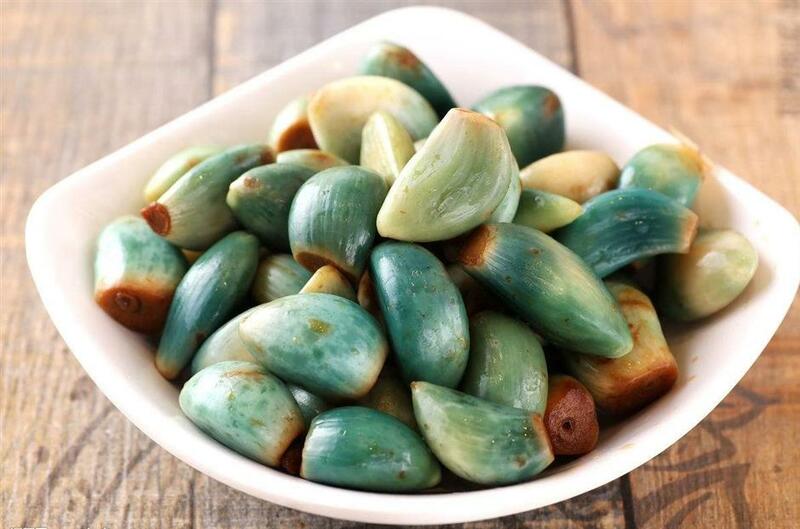 The most common ones are rice, peanuts, red beans, lotus seeds, green beans, jujube, longan, yam, lily’s root, gouqi (wolfberry fruits), pearl barley, millet and other beans. It can be sweetened by sugar or seasoned by salt. Based on a legend, red bean is a must-have ingredient for laba congee since it can protect people from diseases. The tale has it that three sons of an ancient emperor become evil ghosts after death and make people sick. They fear nothing but red beans. Therefore, eating congee with red beans can help dispel possible diseases. 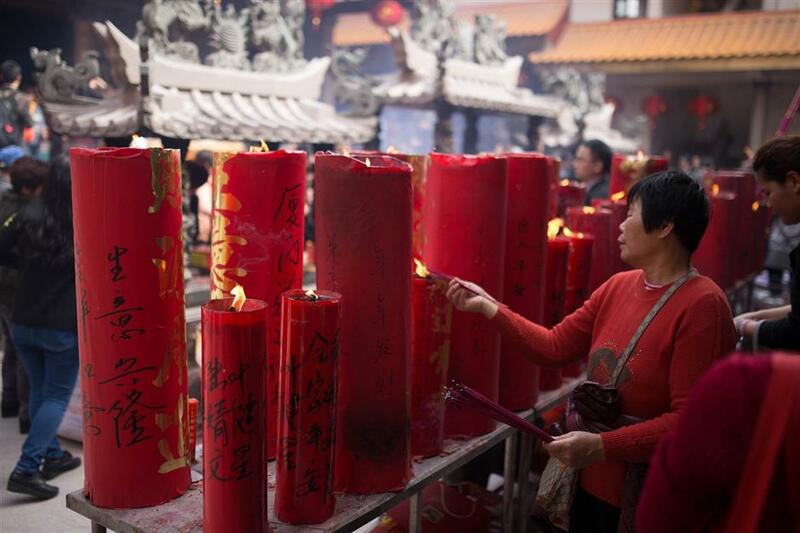 People in Fujian Province burn big, red candles written with wishes for good business at an Earth God temple. Weiya is a tradition based on regional Earth God worshipping which is called ya. 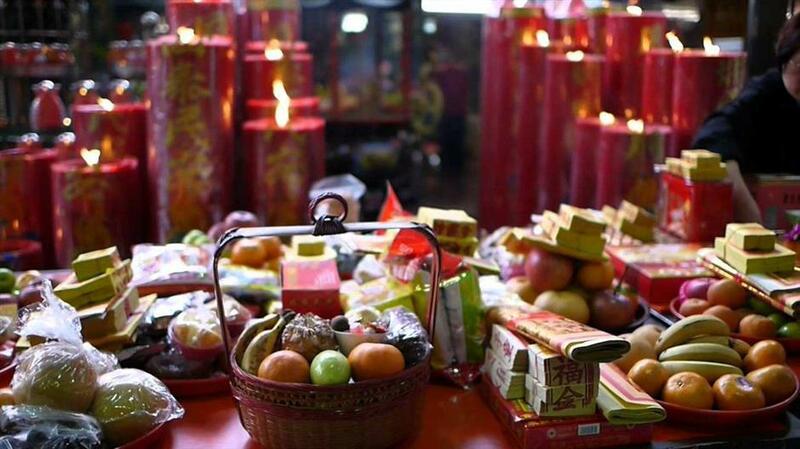 Traditionally, businessmen in Fujian and Taiwan provinces offer sacrifice to local Earth God on the second and 16th days of each lunar month. The 16th day of the 12th lunar month usually marks the last sacrifice of the year, and thus called weiya (wei meaning “end”). It falls on February 1 this year. Apart from offering sacrifices to the god, the businessmen usually also treat the employees on the day as reward for their work. Boiled chicken is traditionally a must course as a good omen for prospering business. But the dish can also work as a hint for dismissing employees. The chicken’s head will be intentionally set in the direction of the employee to be dismissed. If there is more than one to be sacked, the employer will have the chicken’s head point at them one by one. But if the boss decides to keep all the employees, he will either remove the chicken’s head or point it at him or herself.